And The Big Winner Of the Weekend Was... John Carter? John Carter bombed on its release, that can't be denied. Studios though will always do everything they can to try and make up ground on the numbers. It's all about saving face. In this case, while discussing with my brother seeing The Avengers this past weekend, the idea of going to a drive in came up. It's been quite awhile and I've always loved drive ins. After he looked up the information, he informed me that the Avengers was playing with, you guessed it, John Carter. 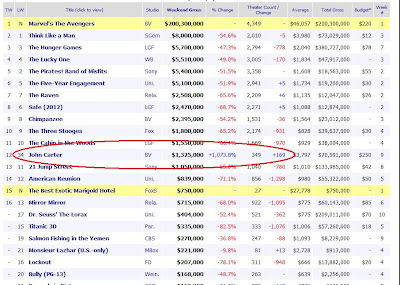 As you can see, John Carter added almost 170 screens this weekend and managed to rake in $1.3 million. Fantastically, that's a 1073.8% jump from last week. Mind you, it's still only made 70+ million to date, and with a budget of 250 million (note, that doesn't even begin to include the cost of marketing) it's not even approaching breaking even. Though, I have no doubt it'll do its darndest to come close when it hits video. Look for it to start circulating that it's the cult underground movie of the year. But that's neither here nor there. 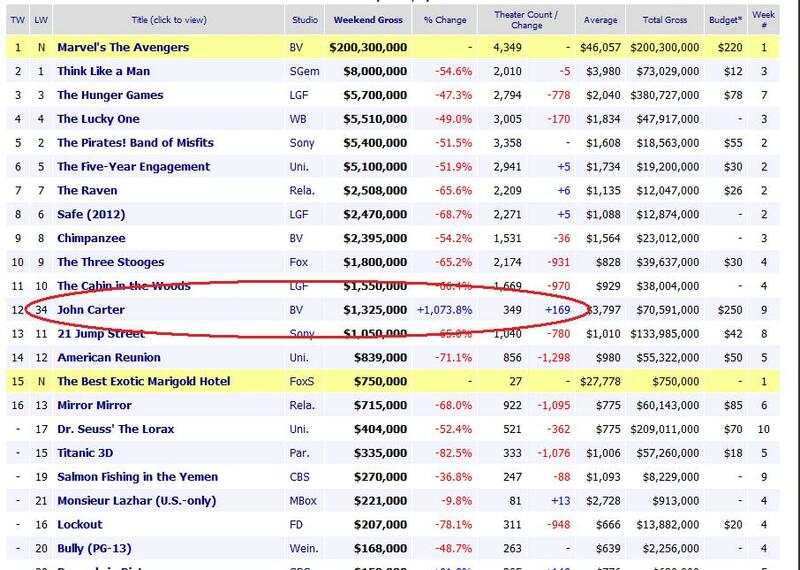 So yes, while The Avengers may have broken records with it's huge opening weekend, the real winner here is old John Carter, which latched on like a sickly leech, sucking what little life it could. John Carter-wasn't that the sequal to wrath of the titans or something. From the marketing that is what my mind thinks. Poor John Carter. I'm guessing there won't be a sequel? lol, that seems highly unlikely. Shame they screwed it up - I really liked the movie John Carter. But not as much as the Avengers! That film was AWESOME. It was just really poorly marketed. Plus the title was horrid. Avengers is deservedly raking in the cash. I too enjoyed John Carter...maybe it was too smart for the audience. I am waiting to see the Avengers this week, everything about it looks great...and then there's Alex's comment above to seal the deal! If it had been sold a different way, I think it would have done better. It was always going to be a rough sell though. Now that sounds like a great Drive-In selection - add me a few of those cheeseburgers that taste like no burger made anywhere else and I am there with the bad speakers. I'm with. The food alone makes a drive-in worth it. Really does seem like a high budget doesn't it? Plus when you consider that the rule of thumb is roughly half the budget is about how much they spend on advertising, then it's still a way off from being profitable. Though it'll definitely do well in the home theater. John Carter is a really good movie. i think it's like you said it's the cult underground movie of the year and people really wanted to wait watch it at a discounted price at the second run theatres. I bet John Carter sees a huge jump in rentals too. it seems word of mouth is starting to spread on this film ala Bladerunner, Fight Club and Donnie Darko. John...Carter? No, I think it really does have that potential. Once more sci-fi geeks like myself pass it around, it'll get that cult following. That's a pretty clever trick from Disney (I think it's all disney, right?). Nice investigative work Mr. Hendrik. I think John Carter doesn't have that kind of appeal to the younger gen...even I would choose Avengers over a pretty dated concept given what we know about Mars.